For days I thought my pick was going to be The Children of Húrin by J.R.R. Tolkien. In that most tragic of epic tragedies, the noble and incredibly tough hero Túrin Turambar fights relentlessly and vainly against a most terrible curse laid upon him by the devil Morgoth. Many evils befall him, and almost all he perseveres through and conquers, but in the end all he loves and all that was ever good in his life is taken away. Briefly he finds peace in the love of a woman who remembers none of her own past nor any of his. In the end, he dies by his own hand after her suicide, because they both had just discovered they were brother and sister. Depressing stuff. But then I saw this book on my shelf and realized, simply, that there were just a few reasons why it makes me sadder than Tolkien’s brutal tragedy. 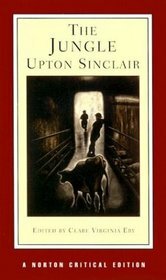 This book is The Jungle, by Upton Sinclair. I actually like and admire it, to some degree, although no one (least of all I) would have guessed so before I read it. Published in 1906, it tells of the struggles and tragedies of a Lithuanian immigrant, a young man named Jurgis, as he tries to start a family and make a living in the slums of Chicago. He fails, through little fault of his own, in the most painful ways possible. It hurts because he is such a likable, naturally honest man – you want him to be happy and good, and feel that he deserves it. Though he is an immigrant with poor English, Sinclair makes him a full, relatable character whose motivations you can always understand. He also wants very strongly to be a good person, but events seem to conspire to pull him into bitterness and anger. He resists as well as he may, but not always successfully. The most famous aspect of the book is the horrible scenes dealing with the Chicago meatpacking industry, in which Jurgis works for a time. In 1906 there were no regulations on the food industry, and the working conditions were unbelievably horrific; workers were frequently mutilated, and sometimes died, and little was done to clean up after them, keep the food clean, or improve safety. The scariest thing is that after the book came out, a federal investigation verified Sinclair’s research – it was all true! That any human beings would have allowed this state of affairs is shameful, disgusting, and very sad. Fortunately, the book led to the passage of the Pure Food and Drug Act of 1906. That quote gets me every time. It shows not only the extent of Jurgis’ anguish, but also how the human soul simply does not have the strength to make itself happy and good against all the forces of a fallen world. Nursing anger turns it into bitterness, and bitterness destroys its bearer. As he roams Midwestern America looking for transient work, he descends into vice and immorality, all the while “writhing and suffocating in the mire of his own vileness” (211). He knows he is degenerating morally, and he hates the fact, but he has no savior. He turns to crime for awhile, making some successful and powerful criminal friends who get him money and a job as a thug, and he tries to convince himself that now he is happier, because he is not as vulnerable as when he had a family to love. But even that falls apart, for crime is not as glamorous as it first seemed. But saddest of all is the happy ending. Sinclair, justly horrified at the conditions of the working class and immigrants, felt that the only solution was socialism, and he makes the Socialist Party the savior of Jurgis. Our poor Lithuanian man, whom we readers have come to love and hurt for, is comforted and led astray by socialist rhetoric, and the book ends with him, happy, strong, and inspired, as he listens to a long and provocative speech by one of the socialists that is nothing but pure propaganda. It is probably the only moment in the book that doesn’t ring true. Everything else in The Jungle is written with a documentarian’s eye for realism and nuance, and most of it works, but here Sinclair gives into his political passions and leaves the complexities of his story and characters behind. We’ve seen Jurgis cheated by political groups with fine rhetoric before, so why should he trust the socialists? Sinclair gives no reason but political sophistry. To make it worse, the socialist speaker uses the name of Jesus as a source of inspiration, calling my Lord the original socialist revolutionary. So Jurgis, who so clearly and desperately needs the saving grace of Christ, now thinks that he is following Him by following socialism. Sinclair wants us to think that Jurgis is now safe, but he isn’t, and that makes me sad.